Tommorrow at 11.26 am IST (5.56 am GMT) a space rock i.e. 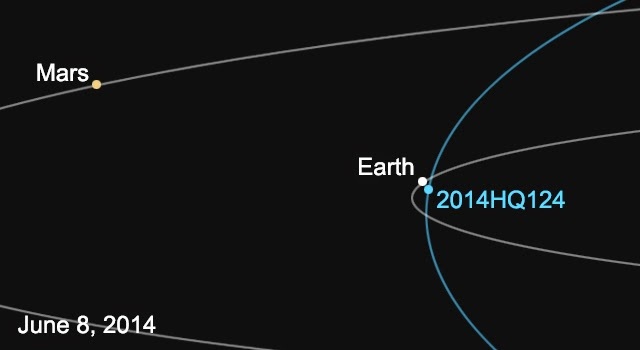 asteroid named as 2014 HQ124 will have close flyby of earth. This asteroid orbits Sun once in every 286 days.Presently this asteroid is travelling @14 Km/sec. The next time this asteroid will have closest approach to earth is in 2017 Novermber 13th. Distance it will miss earth ? The newfound asteroid will safely pass Earth on June 8 from a distance of about 777,000 miles (1.25 million kilometers), more than three times farther away than our moon. The NEOWISE data estimate asteroid 2014 HQ124 to be between 800 and 1,300 feet (250 and 400 meters). Are there any chances of it hitting Earth ? "There is zero chance of an impact," said Don Yeomans, manager of NASA's Near-Earth Object Program Office at NASA's Jet Propulsion Laboratory in Pasadena, California. "In fact, it's fairly common for asteroids to pass near Earth. You'd expect an object about the size of 2014 HQ124 to pass this close every few years." How Scientists are sure about its not hitting Earth ? More than one hundred follow-up observations from NASA-funded, ground-based telescopes and amateur astronomers were used to pin down the orbit of the asteroid out to the year 2200, during which time it poses no risk to Earth. Its trajectory will continue to be recalculated past that time frame as additional observations are received. Yeomans said that 2014 HQ124 is a good target for radar observations using NASA's Deep Space Network antenna at Goldstone, California, and the Arecibo Observatory in Puerto Rico, shortly after the closest approach on June 8. Radar measurements of asteroid distances and velocities often enable computation of asteroid orbits much further into the future than otherwise known. 2014 HQ124 is designated a "potentially hazardous asteroid," or PHA, which refers to those asteroids 460 feet (140 meters) in size or larger that pass within 4.6 million miles (7.4 million kilometers) of Earth's orbit around the sun. There are currently 1,484 known PHAs, but none pose a significant near-term risk of impacting Earth. "Because NEOWISE is a space telescope observing the dawn and twilight sky at infrared wavelengths, it is particularly good at finding large NEOs that make relatively close passes to Earth," said Amy Mainzer, the principal investigator of NEOWISE at JPL. "Using infrared light, we can estimate the object's size, and we can tell that it reflects a fair amount of light. That means it's most likely a stony object."